Personalized Travel Alarm Clocks, Custom Printed in Bulk. Promotional, Very Inexpensive. Bargain Prices for USA and Canada.Translucent Black, Blue, Clear, Green, Purple. We supply bulk puck-shaped Travel Alarm Clocks, custom imprinted with you logo. 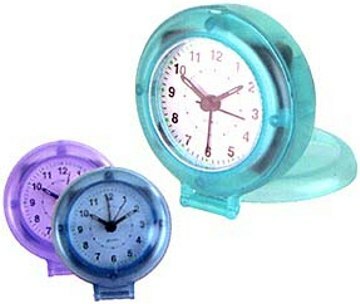 We also supply bulk blank (not custom imprinted) travel alarm clocks for $2.85 each (minimum quantity: 150). Budget Prices in the USA and Canada for personalized travel alarm clocks. American clients pay no taxes. Basic prices include your one color imprint. For additional colors of imprint, please add $0.35 per clock, plus an additional setup fee. Free artwork design. We will send you a proof for your approval before production. We also supply bulk blank (not custom imprinted) travel alarm clocks for $2.85 each (minimum quantity: 150). Production Time: 5-7 days after art approval; rush production is available: contact us. Blank (not imprinted) travel alarm clocks ship next day. Operates with one AA battery (not included). Colors: Translucent Black, Translucent Blue, Translucent Clear, Translucent Green, Translucent Purple. Imprint Size: 1-1/4" x 1-1/4"
Packaging: Individually Gift Boxed; 200 clocks per carton of 36 lbs. Production Time: 8-10 days after art approval; rush productionof 1-7 days is available: contact us. Blank (not imprinted) travel alarm clocks ship next day.